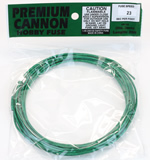 Cannon (Visco/Safety) Fuse 20 feet. Burns about 25 seconds a foot (this would be considered a slow speed). 2mm diameter. This is our slowest burning fuse. 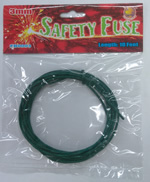 Safety Fuse 10 Feet. Burns at about 23 seconds per foot. About 1/8" diameter. 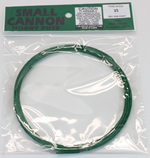 Cannon (Visco/Safety) Fuse 20 feet. Burns about 23 seconds a foot (this would be considered a slow speed). 3mm diameter. Pink medium speed fuse. Burns at 10 seconds per foot. 1/8" diameter and is 20 feet in length. This is medium speed fuse. Perfect! If you order a quantity of 1 you will receive 20 feet of fuse. 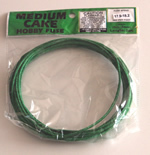 Green medium speed fuse. Burns at about 17 seconds per foot. 1/8" diameter (3mm) and is 20 feet in length. 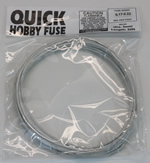 This is medium speed fuse. If you order a quantity of 1 you will receive 20 feet of fuse. Fast Fuse. Burns 4 to 6 seconds a foot. This would be considered medium to quick speed fuse. The fuse will be purple or yellow. Our fastest fuse! Burn times will vary from .1 to .5 seconds per foot. As with all fuse please make this fuse is secured before using. 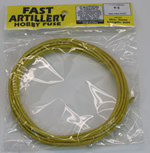 If you order 1, you will receive 1 package of fuse that is 20 feet in length. Bulk Cannon Fuse 100m (328 feet). Burns at about 23 seconds a foot. Fuse is on a plastic roll. 1/8" diameter. Made in the USA. 50 pieces per bag. Connecting a series of cakes and aerial shells together with visco fuse has never been easier. Get that professional looking finale without having to risk getting hurt trying to light multiple fireworks at the same time. 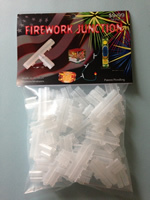 Firework Junction utilizes a series of patent pending ideas which incorporate serrated teeth, living hinges, and snap latches for securely holding 1.8mm to 3mm diameter fuse. The injection molded fuse connector also utilizes a closed tubular design which allows all of the heat and spark from the ignited leader fuse to easily transfer (passfire) to the firework(s) allowing for more positive ignition. Black Zip, 100 count. Great for connecting fuse. 4 in. long. Green zip ties. 100 ties per pack (if order 1 then you will receive 100 zip ties). Four (4) inches long. These ties are a great way to passfire from visco to visco. Red zip ties. 100 ties per pack (if order 1 then you will receive 100 zip ties). Four (4) inches long. These ties are a great way to passfire from visco to visco. Blue zip ties, 100 ties per pack. 4 in. long. Great for fusing visco. Yellow zip ties, 100 ties per pack. 4 in. long. Great for fusing visco. White zip ties, 100 tie per pack. 4 in. long. Great for fusing visco.